Seaweed in a tidal flat on the Snaefellsnes Peninsula, Iceland. Canon 6D, 24-105mm @ 34mm, f/13, 1/5 sec, ISO 200, polarizer. Some readers would like to see us include camera with our photos, so we will do so more often. In December 2016, we invited our blog and newsletter readers to provide input to help us improve our offerings in 2017. We received 338 responses, which are summarized here. We know that December is a very busy month so thank you very much to everyone who participated in the survey! We are sharing these results so our readers can know what to expect from us in 2017. We are also happy to share this information with our fellow income-earning photographers. Although the landscape photography business is quite competitive, we prefer to see our business through the lens of abundance of opportunity instead of scarcity of resources. If this information can help our colleagues in some small way, the result is positive for the landscape photography community. These survey results, of course, are not perfectly transferable from one photography business to another. We have an approach that attracts a certain kind of reader and thus, this information may not be useful for photographers with a different approach. In administering this survey, we wanted to find out how we could improve our offerings. The primary piece of feedback we received is that we are doing a good job in offering useful educational resources but should post more often and more consistently. With this feedback in mind, we hope to publish two to three in-depth and high-quality blog posts each month – a resource that will always be free to our readers. We also hope to share three to four new products for sale this year. Second, our audience would like to see us offer more video content. We agree with this piece of advice but also struggle with it due to our current living situation. Since we are traveling full-time in an RV, developing and sharing videos is complicated. Three straight weeks of heavy rain in the Pacific Northwest or incessant wind in Death Valley makes it hard to record a video from an aluminum Airstream trailer. Still, we are making progress in this area (for example, blog readers and newsletter subscribers will be able to download a free video tutorial this week). We also wanted to use the survey to learn about the major needs and challenges that our readers face with their photography so that we can offer useful information and resources in response. About one-third of our survey respondents said that time is their most significant challenge with photography. The other primary challenges shared by our readers: creativity, finding one's own voice through photography, composition, getting consistent results, photo processing (feeling overwhelmed, not knowing where to start, and getting consistent results), self-confidence, technical skills (for example, consistently getting sharp photos), and location-related challenges (knowing what to do once a photographer is at a location, getting beyond common compositions at well-known places, and finding new locations). Sharing our photographs and travel stories. More location guides, please! Through both the survey responses and emails we receive, we know a lot of people really appreciate our location guides and we get a lot of questions about when we will be covering new locations. While we will continue sharing blog posts on locations, it is very likely that Iceland and Death Valley will be our only in-depth location guides. The main reason is that a location guide can lead to environmental impacts that make us uncomfortable. We have revised both of our location guides to address this concern but even with a lot of information about leave no trace and removing location specifics, we will never be able to change the behavior of the small but problematic group of photographers who only want to “get the shot" and are not concerned about their impact on special places. Since some of the other places we were considering for location guides are experiencing over-crowding and environmental degradation, we decided that we do not want to contribute to such problems even in a small way. Why don’t you offer in-person workshops? While we have offered workshops in Iceland in the past, we do not have any plans to do so in the future. We are planning to move to southwestern Colorado at the end of 2017. With this move, we are thinking about offering small-group workshops in Colorado that are focused on creativity, personal expression, and exploring rather than location-based tours. And, although we do not widely advertise it, we do occasionally lead private workshops when we receive requests to do so. If you are interested in taking a group workshop with us, keep an eye on our newsletter for announcements about possible offerings in 2018. Printed Books: We have received many requests for print versions of our ebooks, including quite a few comments in the survey. We do not have the expertise or capacity to take on the project of creating physical copies of our ebooks right now. We do have interest in eventually publishing a printed book but for now, we are going to focus on ebooks. Anyone who purchases one of our ebooks is welcome to print a copy for personal use. More on gear, please! Our survey results make it clear that some of our readers would like to see us focus more on gear, features specific to camera systems, and getting the most out of your equipment. While we like our photography gear and obviously need it to make photos, we both use old (in digital terms) equipment and do not stay up on new releases. So, we just are not the best resource for this kind of information. If you are interested in this topic, you might like Justin Reznick’s Complete Guide to Gear for Landscape Photographers, Edition III, an in-depth and very helpful resource. Beyond Adobe: We received a lot of comments like this: "You should offer tutorials/use/share information about ____ software." In creating our photographs, we only use Lightroom and Photoshop without any plug-ins or presets other than Tony Kuyper's TKActions for luminosity masks and web sharpening. Thus, we think that providing advice beyond Adobe products wouldn’t be a genuine representation of how we create our photographs. While I have not used their offerings myself, I know that Nicole Young gets good reviews on her On1 tutorials and John Barclay offers popular tutorials for Topaz and NIK Software. And, while the steps might be different, the idea behind the changes we make in Lightroom or Photoshop will apply with other software, as well. What about advice for us film users? We also received quite a few comments about how we should offer advice for film users. While a lot of our information is applicable to both film and digital camera users, we use digital camera equipment. Since neither of us have seriously used a film camera, we do not have the expertise to offer information specific to film users. If you are interested in film photography, be on the lookout for a new ebook on film photography from Alex Burke (coming soon). The survey included six questions. A summary of the responses to the first four questions is below. The other two questions (your biggest challenge/need with regard to photography and how could we improve) are covered above. Question 1: How would you describe your level of experience with photography? Question 2: What is your level of interest in the following photography topics? Question 3: What are your top three favorite ways of learning and developing your knowledge of nature and landscape photography? 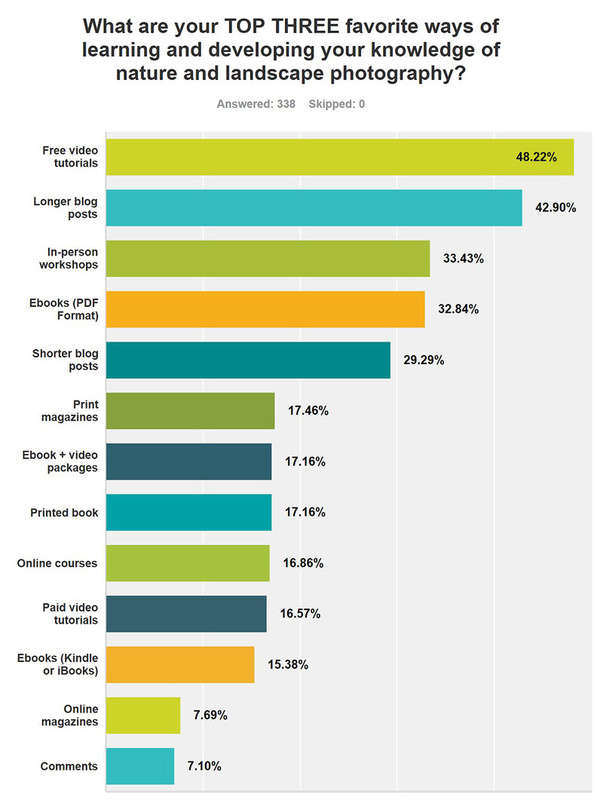 Question 4: When are you most likely to open a newsletter or read a blog post? Thank you again for your participation in this survey and for your support of our photography. If you have any additional comments, please feel free to share them below.